Esta casa beira-mar privado está localizado no Lago Superior senta-se em mais de um acre, tem uma bela praia de areia e é muito isolado. Minutos dos casinos, a Soo Locks, Canadá, Taquamennon quedas, White Fish Point, campos de golfe, museus, casas de luz, neve designado trilhas móveis, grande caça e pesca. Sente-se no deck e apreciar uma xícara de chá como você olha para fora no Canadá e assistir os cargueiros passam na distância. A praia de areia e águas rasas oferece grande natação para as crianças. Este é um perfeito espaço cênico lindo para muitas atividades durante todo o ano. Nicely appointed cabin central to points of interest. The lighthouse is a mile and a half away. Whitefish point is a short hour ride with lots of beautiful beaches along the way. Taquamenon Falls is near Whitefish point and is a must see. The Soo is a quick half hour drive. Lots of touristy stuff to do down by the locks. The beach out back is pristine and a freighter drifts by every half hour or so. We saw a fox and a great blue heron in the yard. Sand pipers ran along the beach one morning. If you are a rock hound the light house doesn’t disappoint. Stop at Lothrops white fish store for the best fish and chips we’ve ever had. The house had everything we needed even beach towels. The only caveat is there is no hand rail to get down to the beach (5 foot drop) which made it difficult for my elderly parents. I am 62 and had no problem. Location is ideal with this rental. Each day, we ventured somewhere new & different. Tahquamenon. Whitefish Pt. Oswald's in Newberry. Pictured Rocks in Munising. St. Ignace & Mackinaw. Sault Ste. Marie & the Soo Locks. None of these were too far away. Oh, and a 24-hr Meijer is close by. We did go there, although never truly needed to--just knowing it was there somehow made us feel like we'd never be stuck without something. The comforts of home, I suppose? Anyway... I digress. Continuing on: a stone's throw from this rental we found much pleasure in visiting the Dancing Crane Coffee House, Wilcox Fish Restaurant, Point Iroquois Lighthouse, and a few other simple stops that further improved our weeklong UP experience. Such a great location. At the home itself, our young daughters took many turns in the swing, and regularly wandered out into the water to sit atop the "mermaid rock"--as they dubbed it--that can be seen in some of the listing's pictures. The water was beautiful, with freighters passing constantly off in the distance, and then Canada just beyond. Very pleasant. Very private. Serene. We had a few fires at the beach. We fascinated at some of the beautiful rocks--the beach is sandy with some rocky patches. One evening, we even had the pleasure of watching a young porcupine and its mother saunter up the large birch tree that leans over the home's driveway. So what drove us to rate it a 4 vs. a 5? Not much, really. As advertised, it was clean. While I did not, my wife did sense some sort of minor water issue perhaps going on around the bathroom & the room w/ the bunk bed. Nothing major and as I said, I could not detect anything myself. We fended off a few earwigs each day that would mysteriously appear in the bathroom. No cause for panic; we just wished we didn't have to encounter them. We couldn't find a cutting board. Okay, I agree that is super nitpicky. Still, a 5-star would have one--maybe we just couldn't find it? To counter that, I suppose I should admit how grateful I was for the high-powered binoculars that the home supplied. I admired those freighters with them daily. Lastly, I had to call the owner to get the key lock code upon arrival. Not ideal. This code was nowhere to be found in my emails or in the VRBO app's arrival instructions. All-in-all, a very good home for our needs & expectations. Simple. Clean. Well-priced. Private. Peaceful. Excellent location. Thank you to the owners and the manager for providing it to us. We loved the size & location of the home, but it was very musty. As mentioned in our previous reviews the house is kept immaculate not sure what odor these guests spoke of. They were extremely rude to my manager when they called her to complain that some electrical outlets were not working in the house. When my manger checked the outlets she found them to be in perfect working order and she also checked the closets and said the house smelled fine. We have not had any other complaints concerning any odor or electrical outlets. Our family of 5 stayed at the cottage in Brimley for 5 days in August. The cottage was very nice. Just like it is described. Very clean & well stocked. Our GPS took us to the neighbors house, but the cottage was easy to find & clearly marked, just pay attention to house numbers when you arrive. The home owners were very lovely to work with. The yard & beach front are lovely. The water wasn't freezing the week we were there so our kids spent a ton of time searching for rocks in the water & kayaking. We had a perfectly clear night to sit out & watch the Perseid meteor shower by the fire. While sitting out a fox (my kids have named Timber) meandered thru the yard. It was so quiet & peaceful. 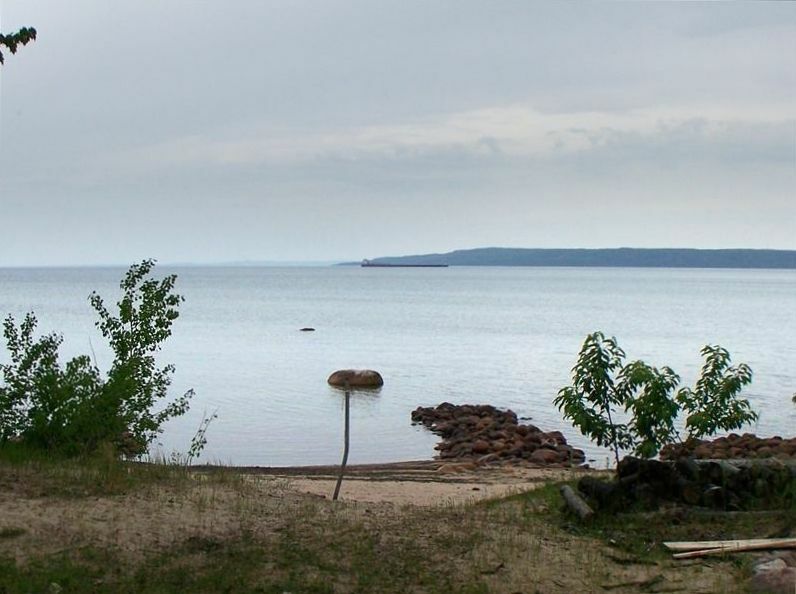 This cottage is about a 25-30 minute drive from Sault St Marie where they have a new Meijer. It took us 30 minutes to get to Whitefish Point, 1 hour to Tahquamenon & 2 hours to Munising. The Iroquois lighthouse is 5 minutes from the cottage. They have a nice walkway, a small museum & you can climb the lighthouse for free. We would gladly stay at the Brimley cottage again! U.P. Michigan is our favorite vacation getaway, and this year we thought we would make life easier and try a rental home instead of camping. My husband and I were in love with this waterfront home! It was right in the middle of all the places we love, AND right on Lake Superior. The home and property were very well maintained, and it made us feel good to know we chose a clean place to stay. What did we hate most? LEAVING! Our 6 night stay was not long enough, and we are missing it already...can't wait to go there again! I really miss the quiet mornings, enjoying coffee and view of the Lake from the deck...AWESOME. Many thanks to Esther and Jim and their Caretakers for making this great dream vacation what it was. Our rental week runs Friday to Friday. Housekeeping is not included in the rental fee.